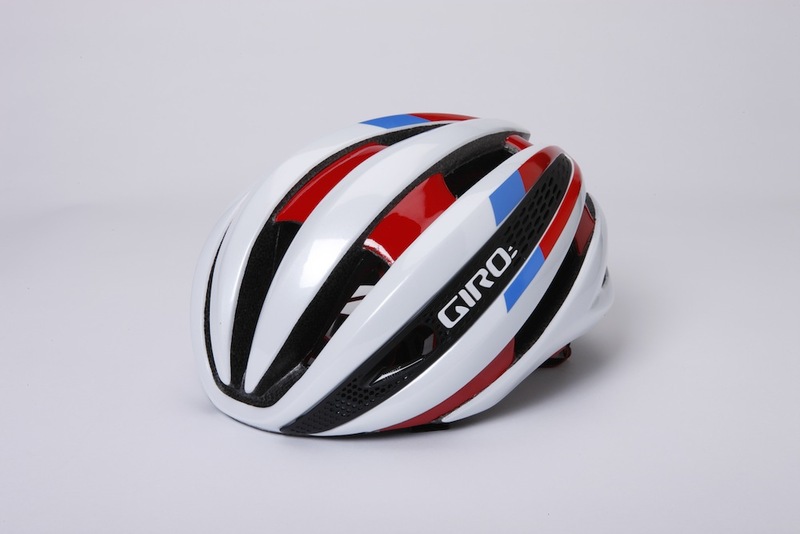 The Giro Synthe ticks all the boxes when it comes to what you want from a helmet. Firstly, it’s fast. Giro claims that its wind tunnel testing shows the Synthe to be almost as efficient as the fastest time trial helmets. It is also very competitive when it comes to weight – on our scales the medium came in at 227g. Where it really stands out is comfort and adjustibility. With Giro’s classic RocLoc fit system you can adjust the fit on the fly by simply turning the dial at the rear of the helmet. What is faster an aero helmet or a time trial helmet? Often helmets that are said to be aerodynamic compromise on ventilation – the Synthe uses a patented design that suspends the helmet over the top of your head, which with the strategically placed vents encourage air to pass freely over your head. If all the above wasn’t enough, there are also vents designed for you to stow your sunglasses. In short, the Synthe is a top quality helmet that largely justifies the high price. For more information go to Zyro. For off-road use, SRAM’s x1 (single chainring) groupsets offer many advantages. They simplify the drive chain by dispensing with the second chainring and front derailleur, removing a potential source of clogging. The clutch rear mech maintains chain tension and prevents chain slap. Whereas the chainring has alternating wide and narrow teeth to ensure chain retention and help clear debris. The ultra-wide ratio cassettes available ensure that there’s almost as much spread of gear ratios as with a two ring set-up. Lastly, SRAM’s hydraulic disc brakes provide a light touch, consistent stopping and good modulation too. When it comes to winter off-road riding, it looks like single chainring set ups are here to stay. For more details go to SRAM. Don’t be put off by the Sportful R&D jacket’s quirky appearance, simply, this is one of the best jackets we’ve had the pleasure to test. It is designed to be worn when the temperature plummets and with its Polartec Alpha insulation it will keep you warm even in truly Arctic conditions. The jacket also does a great job of keeping out the wind and is water resistant enough to keep you dry in all but the heaviest rain – when a full on waterproof jacket might be a more suitable option. Often jackets that do a good job of keeping out the elements fall down when it comes to breathability. Bearing in mind this jacket is designed for low temperatures, the breathability is impressive. In addition to its temperature defying tech it has a nice comfortable fit and has three pockets for your ride essentials. Check out Sportful for more information. Befitting of a turbo trainer that has price point towards the upper end of the market, the Wahoo KICKR has a direct drive design and uses ‘smart’ technology. The direct drive set up removes the need to use a rear wheel and provides a more road like feel than a traditional turbo trainer. However, it is the KICKR’s third party software compatibility that is really impressive. The apps and training websites like Zwift and Kinomap might cost extra on top of what is already an expensive piece of kit, but the variety they can add to your training sessions could be the difference between embracing the turbo and opting not to ride. This is a great turbo, with the only real negatives being the weight and that you can’t really sprint out of the saddle – which are both issues with most turbos. Go to the Wahoo website for more details.